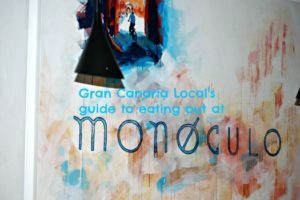 0.1 If you’re looking to eat out on Gran Canaria, we tell you where to go. Our restaurant reviews are an increasingly regular feature. We hope that’s to your taste. 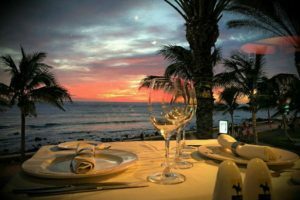 If you’re looking to eat out on Gran Canaria, we tell you where to go. Our restaurant reviews are an increasingly regular feature. We hope that’s to your taste. This week, we visited 200 Gramos, where we were greeted by Brazilian head waiter João. Part of a young front-of-house staff, casually dressed in T-shirts and jeans, he was nevertheless old school in his attentiveness. Explaining the menu in detail, he helped Mr Gran Canaria Local to quit with the umming and aahing, and go ahead and order instead. Regular readers will know we don’t have a set format for blog posts, let alone restaurant reviews. 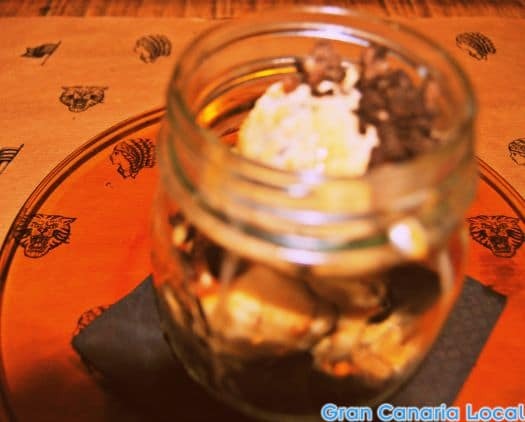 This time, though, we’re going to concentrate on the food and drink we scoffed and slurped down at 200 Gramos. 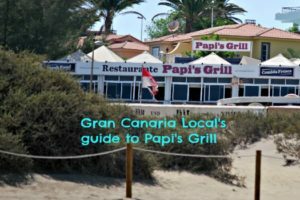 After explaining how to get to this Las Palmas de Gran Canaria burger joint. Your journey to 200 Gramos will probably be less convoluted than Mr GCL’s. For he finished his game of seven-a-side Thursday-night football in San Cristóbal, with teammate Toni dropping him off at the Teatro bus stop. There he hopped on a Number 12 bus and got out at the Parque Santa Catalina terminal. 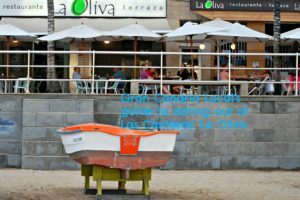 From there, he walked to one of our new favourite streets in Las Palmas de Gran Canaria: Ruiz de Alda. If only more areas of the capital were pedestrianized. This calle‘s buzzing, particularly at night, with bars and restaurants full to overflowing. All have outside tables as the beauty of the city’s climate is that temperatures don’t drop much at night, enabling you to enjoy al fresco drinking and dining into the wee hours. 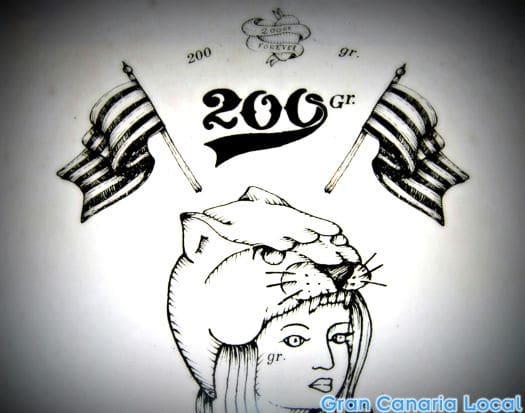 You’ll find 200 Gramos on the corner of Calles Ruiz de Alda and Uruguay, behind the El Cortés section of Mesa y López. It’s a stylish space, with João explaining that the owners decorated their year-old interior with recycled material. And the kitchen’s commitment to organic produce reflects that ecological approach. 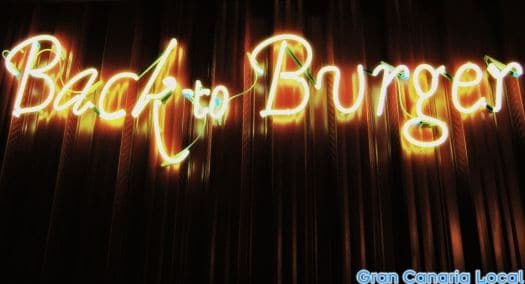 How about going Back to Burger at 200 Gramos? There’s an extensive drinks list at 200 Gramos. Mr Gran Canaria Local was tempted by the Popeye & Olivia Detox (50cl. 3,80€, 0,25CL. 3€). A glass full of the goodness of spinach, coconut water, banana, pineapple, mango, and lime. However, in a bid to rehydrate after his exertions on the football field, he opted for Vaya Vaya Lemonade (3€). Prepared with lemon juice, lime juice, orange juice, vanilla syrup, and soda. It was as good as the home-made lemonade Mr GCL’s grandmother used to treat him to when we popped round for his weekly visit. Suitably refreshed, Mr Gran Canaria Local then asked for a beer to accompany his food. Because that’s the way we roll in Europe. Although, Mr GCL can’t ever recall doing this back in the UK. As well as reviewing 200 Gramos, Mr GCL was there to act as a guinea pig. Because they’d just launched a new veggie burger with beetroot replacing chickpea as the main base. The kitchen offer veggie-friendly alternatives of all their burgers. Before arriving to 200 Gramos, Mr Gran Canaria Local was torn between trying the vegetarian versions of the Canariona (6,5€) comprising black pork, watercress, grilled smoked cheese, and spicy mojo ketchup and Chipotle Hot (5,9€) combining chilli chicken, caramelized onion, lollo rosso, parmesan crust, rocket, grilled tomatoes, and gherkins. 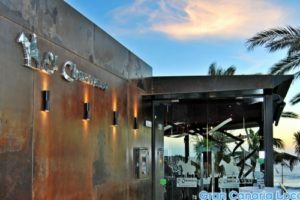 The later was recommended by Fusion Restaurant & Lounge Bar Playa del Inglés‘ Seier Askaryar. Yet after asking for some advice from João, Mr GCL ended up with a Granjera (6,9€), a Sloppy-Joesque concoction of runny fried free-range egg, grilled tomato, goats’ cheese, homemade red pepper jam, and the aforementioned beetroot. 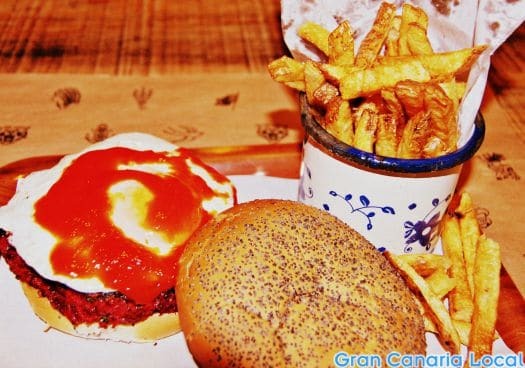 It’s quite possibly the best veggie burger Mr Gran Canaria Local has ever tasted and we can understand its iconic status. The Granjera even boasts its own ad. Mr GCL paired his exquisite burger with papas fritas salt & vinegar (1,9€). Well, you can take the boy out of east London but you can’t take east London out of the boy. He finished off with the classic Uruguayan dessert of polvitos, with added Oreo crunch. 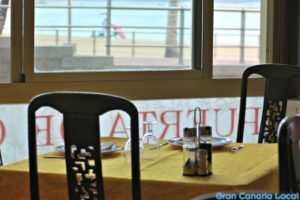 Whilst Mr Gran Canaria Local had worked up an appetite playing football, he worked off his satisfyingly full dinner by walking all the way home to Arenales. 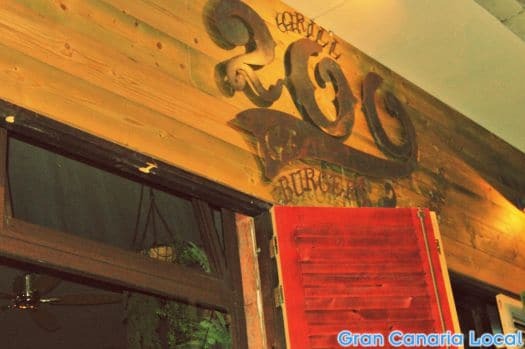 Disclaimer: Mr GCL enjoyed a complimentary Thursday-night meal at 200 Gramos. We’re committed to sharing with you our latest gastronomic discoveries on the island. Of course, we’re always open to suggestions.